Miller Trophy (Open) Best of Paphiopedilum Alliance in show Paph. Ross Otto Paphanatics, Unltd. Wilson Trophy (Open) Most Unusual Orchid Flower in show Megaclinium purpureorachis Cal-Orchid, Inc.
Marosz Trophy (Open) Most educational exhibit. All displays are eligible. 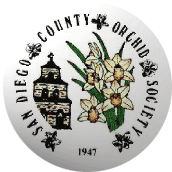 SDCOS Cash Prize (Open) Best exhibit to include 10 or more flowering orchid plants with background material, covering 100 sq feet or more. All displays are eligible. SDCOS Cash Prize (Amateur) Best exhibit to include 10 or more flowering orchid plants with background material, covering 100 sq feet or more. All displays are eligible. 8 Paphiopedilum - Complex Hybrids - Open Paph. Ross Otto Paphanatics, Unltd.